Rollaway unites the warmth and storytelling of the Southern States with the ramshackle roots of the Northwest in a colourful blend of raucous guitar licks, five-part harmony, and poetic rock n' roll; in short: y'allternative. "The Return of the Lonesome Coyote Patchwork Pulpit, and Sundry Other Tales from the Rainbow’s End" is seventy minutes’ worth of hard won alt-roots gold chronicling four years in the life of expat Georgian singer songwriter Benton Roark. After the original New York-based Rollaway disbanded, Roark relocated to Vancouver along with vocalist Sarah Wolfman-Robichaud and assembled an eclectic team made up of some of the city's best locals and transplants, including Jen Lewin and Adam Tryczynski of Stronger than Lions, Martin Reisle of Maria in the Shower, Brian Nesselroad of the Fringe Percussion Group, and Adam Jones of The Mackenzie Jones Big Band, among others. The new Rollaway recorded the vast majority of "The Return…" in their East Van rehearsal space home, infusing the mostly sober and often stormy material with warmth, grit, and conviviality. At times painfully honest and at others mysteriously mythical, the well-crafted poetry is set to five-part harmony, raucous guitars, ethereal pedal steel work, vintage Rhodes and Hammond colours, lush strings, and upright bass-driven, big-beat rhythm. The sound is what you might imagine given the history of the writer and producer (Roark), who also works in the avant-garde classical realm: a quasi-conceptual and highly-artistic blend of Southern gothic, ramshackle West-coast roots, and dark romanticism. Artwork by Stephen Key. Graphic design by Benton Roark. Blue", and "Silver Threads Among the Black"
Jen Lewin - Hammond organ on "Blood Sun Rising"
Tallulah, River in My Dreams"
Rollaway is a roots/rock band based in East Vancouver with strong ties to the southern states from where its founders Benton Roark and Peden Young hale. 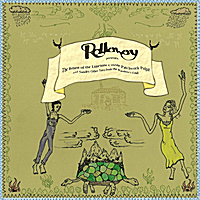 They have released two records – Rollaway and The Rollaway B-Sides EP – and have a third (for which a five-track demo is available) scheduled for release in the fall of 2010. The current lineup consists of Roark on rhythm guitar and vocals, Sarah Wolfman-Robichaud on vocals and percussion, Adam Tryczynski on lead guitar and backup vocals, Adam Jones on upright bass and backup vocals, Jen Lewin on keyboards and backup vocals, and Brian Nesselroad on drums. Except for four tracks written by Young on the self-titled début, Roark has written all of the material, which is stylistically aligned with classic acts such as The Band, The Allman Brothers, and The Grateful Dead, as well as recent ones such as My Morning Jacket, Fleet Foxes, and Ryan Adams and the Cardinals. With all of its members trained in multiple genres – jazz, classical, rock, and folk – Rollaway combines a sense of harmonic and formal experimentation with a direct, story-based lyrical approach that together have been creating a buzz both locally and stateside.